I can’t remember a time without you. You’ve caused sluggish performance, slow page loads and have put me at risk many times. Adobe Flash Player, it’s time to go. It’s no secret that Flash Player is not the best web plug-in to have. A long history and list of security vulnerabilities. Very demanding on your system causing older machines to feel terribly slow when they really shouldn’t be. And these days HTML5 pretty much replaced Flash everywhere it matters. I have removed Flash Player from my system before but somehow it always found it’s way back on. Today however I decided to remove it once and for all. Why? Security mostly. I don’t have any Macs that are too old to properly load and run a website that relies on Flash Player but the never ending security vulnerabilities basically just pissed me off. I keep Flash Player up to date. The second an update is available, I install it on all my systems thinking at least it’ll protect me from the latest vulnerabilities. Sure there are vulnerabilities out there that have yet to be discovered but as long as they are not known to the mainstream, I should be safe from them. Today another Flash Player vulnerability was patched, a 0-day that was being used in the wild for quite some time. Hacking Team, a company that specializes in surveillance software and will sell to anyone that pays, was hacked a few days ago. The hackers cleaned out their poorly secured servers and dumped all the data online for anyone to see (over 400GB worth). In that data this Flash Player 0-day was discovered and Adobe pushed out a patch as soon as possible. It’s not the first 0-day to be discovered and it most certainly won’t be the last. But this one may have been around for a while and could have been sold to government agencies and dictatorships alike and be in active use by them. That just irks me. When I tell friends and family to update their Flash Player the first thing I hear is “I just did that!” or “Again? !” and they’re right, it’s ridiculous. 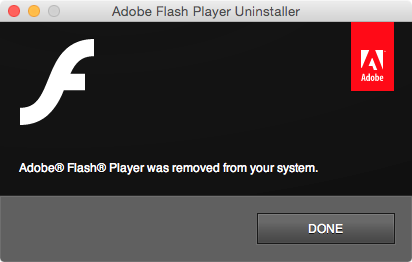 So, goodbye and good riddance Adobe Flash Player. Its a headache I can do without. If you want to uninstall Flash Player, go to your Applications > Utilities folder and in it you’ll see “Adobe Flash Player Install Manager.app”. Run that and Flash Player will be removed from your system. I doubt you’ll miss it as all sites that matter have switch to HTML5 by now which requires no plug-in to function. If you’re a laptop user and use a lot of websites that call on Flash Player, you should notice an increase in battery life and every computer user, laptop or desktop, will lighten the load on their processor. [UPDATE July 10] The Hacking Team leaked data has revealed a second 0-day exploit which is at the time of writing still unpatched. Now that it’s public, expect this exploit to be in the wild very soon, if not already. [UPDATE July 12] Oops, make that TWO new 0-day exploits that are unpatched. Still have Flash Player installed after all this? Good luck.